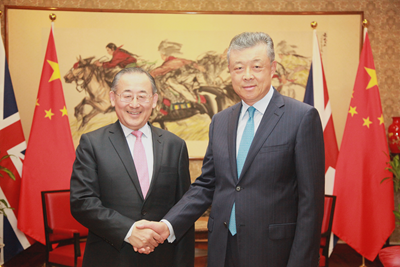 On September 12, 2017, Ambassador Liu Xiaoming met with Tang Qian, the Assistant Director-General of UNESCO, during the latter's visit to the UK. Tang briefed the ambassador on the development of UNESCO and its cooperation with China, saying that UNESCO is committed to promoting world peace and sustainable development through the strengthening of international education, science and technology and cultural cooperation. China has made remarkable achievements in education, science and technology and culture, and has carried out fruitful cooperation with UNESCO. He is willing to further promote the exchange and cooperation between UNESCO and China. Ambassador Liu said that UNESCO has a unique position and an important role. In recent years, the cooperation between China and UNESCO has kept expanding. As China and the UK further consolidate the "Golden Era" of their bilateral ties, the people-to-people and cultural exchanges and cooperation between the two countries are full of highlights. China and Britain are both founders and important members of UNESCO. China is ready to strengthen cooperation with Britain under the framework of UNESCO to jointly contribute to the promotion of mutual learning between world civilizations and the construction of a community of common destiny.